Having touble controlling your Annual Bluegrass Weevil (ABW) populations? You’re not alone. Insecticide resistance in ABW is a growing and expanding problem. And because the major resistance mechanism involved, enhanced metabolic detoxification of the insecticide active ingredients, is not very specific, the resistance can be very broad. 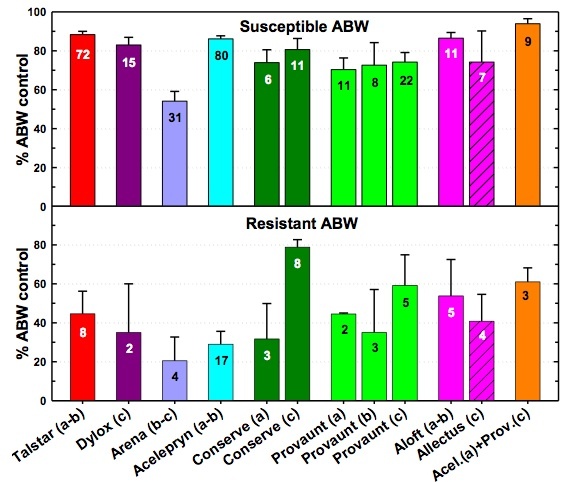 Efficacy of common insecticides against susceptible and resistant ABW populations. *a, b, c = ~4/15-5/3, ~5/4-17, ~5/18-6/10 average application timing; NY Met. area. Numbers in columns indicate number of trials in summary. In the above graph efficacy trial data obtained from apparently non-resistant ABW populations (on top) are compared to those from resistant population (bottom). Clearly, most classes of insecticides and major modes of action are affected, even combinations of different modes of actions wether applied together or sequentially. Only one product, Conserve, does not seem affected, but only when applied against larvae. In some sites, things looks much worse than in this data summary. So how did this happen? Very simple. Excessive use of insecticides, particularly of the pyrthroid class. To have a better idea how this happened check out my slide sequence ‘Simple Model of Resistance Development’ in ABW presentation (see bottom). Resistance genes occur naturally at very low frequency in insect populations. Insecticide applications give the individuals with resistance genes a better survival rate and with that reproductive rate. If the selection pressure is kept up, the frequency of the resistance genes will increase from generation to generation until the majority of the population is resistant. Resistance development goes undetected until the percentage of resistant individuals is high enough to decrease control levels to a point for which no more other excuse can be brought fore. Most golf courses that have tried to control this insect intensively (i.e., several applications per year, or even several per generation, over large areas) for at least 5 years will probably have some level of resistance. Continued intensive insecticide use will only further tigthen the noose. This insect is not business as usual. It will come back with a vengeance. What to do? You can test or have somebody test whether your ABW are indeed resistance. But if you have already seen adult ABW having a party on an area treated with an adulticide a couple days before, it should be pretty obvious what is going on. The adult might be knocked out initially, but their hyperactive detoxification systems allow them to recover within days if not hours. Time to rethink your management approach! There is no quick fix to this. Don’t count on the next silver bullet. Not much coming down the pipeline. And no reason to assume that the ABW couldn’t figure out over time whatever new synthetic stuff you throw at them, if you overuse it. Research clearly shows that creeping bentgrasses can tolerate several times higher densities of ABW larvae before showing damage than Poa annua. And the damage to bentgrasses vs. Poa is like the common flu vs. Ebola. The most sustainable way to deal with ABW therefore is to reduce Poa as much as posssible wherever possible. Start with the affected fairways, then eventually work you way up to collars, approaches, etc. As far as insecticides go, minimize adult treatments and concentrate on the larvae. This allows more precise monitoring and with that more targeted treatments. In the end, you need to reduce treatments to only when and where really necessary. And forget about things that clearly don’t work. This will also allow natural enemies to start playing a role again. Overall this approach allows susceptible individuals to infiltrate the resistant population and decrease resistance levels. Conserve at ABW rate (0.4 lb ai/acre) is pretty expensive. But why waste money on less expensive things that don’t work and might make things worse? So, in the first year apply Conserve to all playing surfaces with ABW damage history, about 1 week into full bloom of hybrid Catawba rhododendron. This material needs to be watered in immediately (0.25″). During summer apply only if and where high larval densities warrant action. In areas at particularly high risk, but only if you see a lot of adults, apply chlorpyrifos (1 lb ai/acre). But remember: if you overuse these material, the ABW will figure them out eventually, too. Over time you need to minimize treatments as much as possible, especially chlorpyrifos. Consider rotating Conserve every few years with other unaffected materials. The nematode Steinernema carpocapsae can do a decent job against larvae. We are testing some new biorational materials that could be pretty cheap and easy to use. For more detailed info see ABW presentation on my webpage http://www.rci.rutgers.edu/~insects/amk.htm and Koppenhöfer et al. (2012: Controlling annual bluegrass weevil: optimal timing and rates. Golf Course Management, March 2012, 98-104).